The first ebook reader program that I want to discuss is Adobe Digital Editions. This program is used to manage the transfer of DRM* Adobe eBooks (both PDF and ePub) between your computer and many ebook reading devices, such as the Nook, Sony Reader, BeBook, Cybook, and others. I’ve been using Adobe Digital Editions since it first came out. I’ve been involved with providing tech support for this program and developing documentation on its use (no, I don’t work for Adobe.) I have researched and solved many of its error messages. I have been able to compile some instructions for the best way to use it, which I will share below, along with some other related topics. * DRM stands for Digital Rights Management. It’s the digital security that prevents a user from passing around an ebook for free. DRM is a controversial topic and I will probably discuss it in a lot more detail in a later post. The authorization process that Adobe Digital Editions uses is probably the most important thing to learn. This is the way in which the software tries to make sure that you are the person who bought your ebooks, and you didn’t get them emailed to you for free from someone else. You should authorize your copy of Adobe Digital Editions before you buy any ebooks. This will save you a lot of headache later on. I would say that the majority of error messages that people get result from not authorizing Adobe Digital Editions, or from authorizing at the wrong time. So just go ahead and authorize it right after you install it. The first thing you need to do is create an Adobe ID. This is the account that you’ll use to authorize Adobe Digital Editions and all of your ebooks in the future. Create an Adobe ID here. Once you have your Adobe ID, you can do your authorization. Open Adobe Digital Editions, and click the downward arrow next to the word LIBRARY. Then click “Authorize computer”. From there, all you have to do is sign in with your Adobe ID and follow the instructions. From here on out, all of the ebooks you buy while under this authorization will be tied to your Adobe ID. Try not to mess this up by switching to a different Adobe ID later. That will render your ebooks unopenable. The Adobe ebook downloading process makes use of files that end in .acsm. That stands for Adobe Content Server Manager. This is one of the things that causes a lot of confusion for people. This file is what you initially download when you start an ebook download. It acts as a “transfer file”, managing the communication between the download server and Adobe’s servers. My understanding is that it verifies your Adobe ID and then starts the ebook download process. The majority of the time you won’t even see this file or have to interact with it. If everything goes smoothly, it will do its job in the background and begin your ebook download for you. If you don’t have Adobe Digital Editions installed, your computer won’t know what to do with this file. People often complain that they got a small file ending in .acsm but they didn’t get the book they bought. That’s because they didn’t follow posted instructions for downloading Adobe Digital Editions and authorizing it before they tried to download their ebook. This gives some people a lot of trouble. It seems like you’d be able to transfer an Adobe ebook via a thumb drive, flash drive, CD, or over your home network, but that doesn’t work. When you try to open the ebook on the second computer, you will likely get an authorization error message, telling you that the ebook was authorized to another user. All you have to do is download the ebook to your second computer the exact same way you downloaded it the first time (if you did it properly). You should install Adobe Digital Editions on the second computer and authorize it with your Adobe ID (the same one you used before!). Then, login to your account at the website where you bought the ebook, and download it directly to the computer where you want to read the ebook. 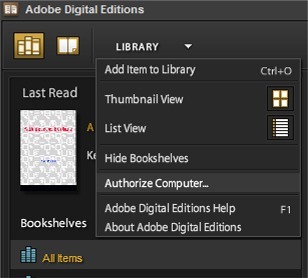 If you’ve purchased an ebook that requires the use of Adobe Digital Editions, then you must use Adobe Digital Editions to manage the transfer of the ebook from your computer to your reading device. This is because of the same authorization issues that we’ve discussed above — Adobe wants to make sure that you own both the ebook and the reading device, and it does that via the authorization process. The first thing to do is make sure that you’ve authorized Adobe Digital Editions with your Adobe ID account, as explained previously. You will have to authorize your device with the same Adobe ID. Connect the e-reading device to your computer via its USB cable, and turn it on. Adobe Digital Editions should detect the device and prompt you to authorize it with your Adobe ID account. After that, the name of your device will appear on the left side of Adobe Digital Editions in the “bookshelves” area. Now all you have to do is drag an ebook from the Adobe Digital Editions library to the device name. The device shown in this screen capture is the Bebook, which is the e-reading device that I own. Your device name will be what shows up in your own bookshelf. Adobe Digital Editions can be very easy to use as long as you do what you’re supposed to. Just make sure to authorize it before you buy any ebooks, and make sure to always use the same Adobe ID when dealing with any ebooks or e-reading devices. That will protect you from 95% of all problems and error messages, and you’ll have a stress-free ebook reading experience. If you have any tips for getting good use out of Adobe Digital Editions, please leave a comment! Question about the prevalence of ebooks that require ADE. I run Linux, which I know ADE does not support (except perhaps under WINE). I’m thinking about buying an ebook reader but what to make sure there will be enough selection out there that I can download and manage on my Linux machine and between it and whatever device I end up buying. Are there DRM titles available that do not require ADE? A related question, which device would be best able to handle DRM titles that do not require ADE (and, therefore, might be manageable under Linux)? I’ve been looking at the Nook – in part because it’s the only one with a user-replaceable battery – and the Kobo. Would either or those be a better choice for a Linux user or is there another device I should consider? Thanks. If you’re asking about PDF files, then the answer is: not really. If you have a PDF ebook and it has DRM, the DRM will require the use of Adobe Digital Editions. That is just how Adobe has their software set up right now. It is unfortunate that they are not providing ADE for Linux, and it’s also a little ironic since some of the main e-reading devices like the Nook run on a version of Linux. The source of the problem is that most book publishers want DRM on their ebooks. Adobe provides that for them, but only through the usage of Adobe Digital Editions and their Adobe Content Server. As far as e-reading devices go, the only thing I can really suggest is to look at the tech specs to find out which non-DRM file types they support. But, as you know, you’re not going to end up with much selection. In my experience, some small independent publishers and authors are selling ebooks without DRM, but just about any bestseller that you’re interested in will have DRM. If you find a good solution for Linux users, please let me know. what if you did or already changed your adobe id and it makes them unobtainable? how do you make them accessable again? Future thanks for the help!!! I have been racking my brain for DAYS trying to figure this out!!! PLEASE HELP!!! When you say “it makes them unobtainable”, do you mean the ebooks that you’re trying to open? You probably just need to re-authorize with the original Adobe ID that you first used. I have a post that explains how to do that here. Hi, I see that you have a much better understanding of Adobe Digital Editions than I do! I unknowingly “did the wrong thing” and did not authorize my computer with my Adobe ID when I downloaded my first eBook. I saw that it downloaded, read a few pages, then decided to authorize my computer with my Adobe ID…and now I can’t read the book at all! I de-authorized my computer and tried to read the eBook again and it is still inaccessible, saying it’s registered to another user. The company I bought the eBook from is not helpful at all (awesome). Is there any possible way to get access to the eBook again? At this point, the only thing I know of that will fix this is if you get a fresh download of the ebook that is not tied to any Adobe ID (or a lack of authorization with an Adobe ID). The company where you purchased the ebook has to provide that for you. I am reading an adobe pdf ebook from the library on my ipad. I was able to transfer through adobe digital then blue fire reader. My problem is, when reading the pages on the ipad are a little too big, 3 or 4 lines are below the bottom of the ipad and need readjusting. In the PDF format I am unable to access the settings tab to change the font or screen size. Do you have any suggestions. Why are you unable to access the settings tab? That shouldn’t disappear just because you’re using a PDF vs an ePub. This is hard for me to diagnose since I can’t see what’s happening on your iPad. Is it perhaps just a matter of scrolling up or down so that it is visible? They should have more information. I m android developer..I m developing ereader by using RMSDK9. I’m sorry but I don’t have any idea. I’m not a developer. The information on this blog is for the user end of things. Good luck with it! I have an ipad and can’t download adobe flash player, who knows why. Does that mean I can’t transfer epub books to ipad ? Or is there some way around this? I want to authorize my new Nook WIFI (and my WIFI is down). I downloaded and installed Adobe Digital Editions, created an Adobe ID and authorized my computer. I have downloaded books to my computer. With ADE open, I plugged in my Nook. ADE detects it but DOES NOT ask to activate. I pressed Ctrl +shift+E. Unplugged the nook and replugged it. I opened the Nook drive and deleted the file entitled adobe.digital.editions. I closed it, plugged off, plugged in the nook. (As customer service instructed) It still does not prompt to authorize. I have dragged books to the Nook in ADE. I can see the book titles on my reader but when I try to open it: User not activated. How do I get ADE to prompt to authorize the Nook? Under the library tab, it has authorize computer (done). Nothing else. First, restart the computer. Sometimes when you’re messing with different hardware that connects to the computer via USB, the computer sort of “forgets” that the device is there. Restarting can help. 1. Begin with the Nook off and not connected, and Adobe Digital Editions closed. 2. Open Adobe Digital Editions. 4. Turn the Nook on. 3. Open Adobe Digital Editions. 3. Turn the Nook on. 4. Open Adobe Digital Editions. If none of that works, uninstall Adobe Digital Editions, and then reinstall it. If that doesn’t work, see if B&N has any firmware updates for the Nook that you could install. If that doesn’t work, call/email B&N Nook support and tell them everything you’ve done. I’d be interested to hear back from you about this. Please let me know if any of that solved the issue for you. I’ve recently bought an ereader (Rockchip V1.0.5) and i’m having problems opening the books i’ve bought and downloaded. An error comes up saying “File opened failed”. I’ve sent the ereader back to the company i bought it from in case it was faulty, they’ve downloaded 2 books onto it which open no problem. I’ve followed your step by step guide to the letter and it still comes up with the same error. Any help would be greatly appreciated, thanks. It’s pretty difficult for me to help with this since I don’t work for either of the companies involved. But my guess is that this ereader isn’t supported by Adobe’s DRM. I did a Google search for the ereader name that you gave and couldn’t even find a place to buy it, so that suggests to me that it’s a knock-off or something similar. Generally speaking, if your device isn’t on that list, the instructions I gave in this post don’t apply. They are only for DRM-enabled ebooks to be loaded onto a device that is supported by Adobe’s DRM. I suspect that the company you bought the device from is just loading standard PDFs or ePubs onto it. I recently purchased a Samsung Galaxy Tab 10.1. Is Adobe Digital Editions app available for this tablet. I check out library books and would like to read them on my Galaxy. Any help would be appreciated. Hi I recently started having problems with my Aluratek reader. ADE doesn’t recognise or show my reader so I can’t download books to the reader….. what the heck did I do wrong???? MY BROTHER BOUGHT ME A KINDLE FOR MY BDAY. WEVE ALREADY REGISTERED IT AND I HAVE DOWNLOADED ADE BUT I CANT SEEM TO TRANSFER THE EBOOKS TO MY KINDLE> PLEASE HELP! The Kindle doesn’t work with Adobe Digital Editions. You can pretty much only use Kindle ebooks bought from Amazon. Hi, I have a BlackBerry Playbook and I can’t seem to find Adobe Digital Editions for the PB. Do you have any advice? – Adobe Digital Editions doesn’t actually go on any devices. You just use it on your computer to transfer ebooks from your computer to the device. – The last time I read anything about ebooks on the Playbook, my impression was that you had to use the Kobo app. I’m not sure but that might mean you can only get ebooks from Kobo for it (besides ebooks that don’t have DRM). I have been downloading books just fine and I just got the ACSM file has expired error message. I double checked and I am still logged in to adobe on my overdrive app. I tried two different books and got the same error. ps. this happened on my iPod touch. It downloaded fine on my desktop. When using FREE e-books in PDF format ( like Internet Archive, or GoogleBooks), does ADE put DRM on the PDF files when you convert them from desktop use to ereader use? I have to put files on FIVE Nook reader- SDchips for homeschooling students. Do I have to authorize EACH reader AND chip to transfer these files, or can I authorize 1 reader-chip, and then copy the materials to the remaining chips? Our kids LOVE their nooks, and being able to use them for school-work was the entire purpose of the purchase. Any assistance in explaining all this to a “non-techie” Mom is greatly appreciated! Thanks In Advance!! Adobe Digital Editions doesn’t have the ability to add DRM to ebooks. 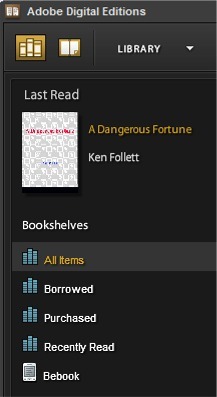 ADE is just a small program that can view ebooks (and was built to interact with Adobe’s DRM system). Basically, DRM is handled by the Adobe Content Server, and is implemented by each ebook store for specific ebook purchases and downloads. If an ebook isn’t sold with DRM, there is no way DRM will be added to it later on your computer or e-reader. Hi my problem is I purchased & downloaded a book from Angus & Robertson, when i go to open the book on my ereader i get an error message “File open failed”. I can’t work out what the problem is because I did exactly the same thing 2 days earlier with another book from the same place & in the same format & it works perfectly. Hi, I’m just wondering if what are you meant to do if Adobe Digital Editions does not detect your device? I have a Acia tablet and when i hook it up to my computer via the usb cable nothing happens. I know that it works as I’ve only just transferred a book to my daughters ereader. Thanks for the blog! Another question for you — My HP netbook got hit by a virus so I wiped and reinstalled everything. Somehow, when I first reinstalled ADE, it recognized my Aluratek Libre. Now it won’t give me any prompt to authorize the Libre, and won’t transfer my Overdrive library books. (It used to do it all the time.) I’ve uninstalled and reinstalled ADE several times, but each time it somehow recognizes the Libre, and won’t give me the authorization prompt. Is there some way to authorize the Libre directly on the ADE website? Or am I missing some little file that keeps “introducing” the Libre to ADE? Hi! I just dowloaded Adobe Digital Reader to my Mac in order to use on my Nook. When I try to authorize my computer with my Adobe ID, I get a message about the Adept Request Expiring. I accidentally purchased/downloaded a book under a different adobe id for my Sony Ereader. Now I can’t get it onto the ereader at all or even open on the computer. What can I do? You’ll probably have to get the website to issue you a new download link or reset the download somehow. You can’t really get around using the wrong Adobe ID unless you know how to break the DRM. Ok so I have Downloaded my first eBook today, but this is the first time I have come across ascm file extension’s on a file. I know how to use PDF and I have 5 qualifications in computers, but not being the sort to take my hand to the book face, I do very little reading. So after doing some research and finding out about Adobe Digital Editions I went ahead and downloaded it. Now after registering my adobe ID I am unable to authorize my computer and receive the following error. Since i’m not in the habit of decrypting encryption keys without permission, (nor would I be able to with out a calculator), and since this MSG has to sets of time and date functions in it, I assume it must be for the activation sequence in some way. Server communication problem: E_ADEPT_REQUEST_EXPIRED”. ADE has been authorized to my computer. Please advise. Hi – I purchased a Barbie eReader for my daughter. It says it uses ADE and tells you how to use it which is fine. I have authorized both my PC and the device. I went to download some eBooks from my local library. I dragged and dropped the files across to the device and they appear fine on the eReader, however when I go to open the eBooks I get the following message “Invalid active info”. I have used ADE numerous times before for other devices with library eBooks and had no problems, but now I’ve struck this message. Can you offer a suggestion please? Unfortunately I just don’t know much about ebooks that come from libraries because it’s a totally different system than what I work with. Hopefully someone else reading this page will have a suggestion. You might also have more luck asking your library tech support directly. My adobe digital editions seems to be stuck “initializing.” I first tried downloading it and plugin kept crashing. Then finally downloaded and authorized, but didn’t do anything after clicking finish. I would try to download a book and I just get the acsm file. I’ve called adobe support 3 times and first they thought it was a problem with the ID but it didn’t get fixed and then the other 2 times, they said they would send it up to a supervisor. I did an online chat and she said to open under a new admin account and I got further with that. It downloaded and I entered same ID in and it showed more menu options, but when I tried to download a book, still was acsm file and adobe reads initializing and that’s all that happens. Any thoughts? I’ve been struggling with digital editions for 2 weeks! I have a huge problem / headache to read my books through BlueFire reader on my iPad2. i’ve downloaded and installed BlueFire, then logged in to the site where I purchased my books, and download the book. It gives me the option to open the book in BlueFire, when I select it, BlueFire asks for an AppleID and password, which I then enter. But then it tells me the ID is not recognized or the password is invalid. What can I do? I can read the books perfectly on my pc. Help! I have spent a good 24 hours in the last week trying to download Adobe Digital Editions so that I can then download my ebook for a bible study that comes only electronically. I signed up for my id. Then I tried to download ADE. But Ahhhhhhhhh!